Late May took me to a lovely cottage in Cheam, Surrey to carry out another house contents valuation for probate. The property was delightful with a mature landscaped garden well kept and in full bloom where i enjoyed a pot of tea with the executor. After my tea I proceeded with valuing the contents which consisted of some lovely 18th century oak pieces of furniture including a longcase clock, hall chair and carved chest or coffer. A pair of nice Georgian Mahogany bow front chests, Victorian Mahogany linen press, Victorian Workbox, Teapoy, oak open back dresser on stand along with a balance of modern residual furnishings. A small amount of solid silver tableware, with accompanying silver plated dishes and the like. Overall a respectable amount after including items of jewelery amounting to £1500. 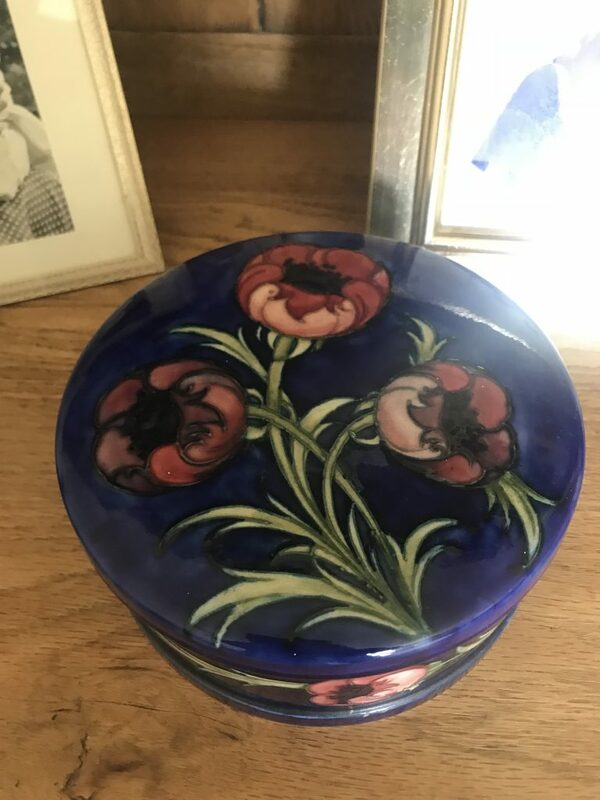 The focal point for me as an admirer was a very nice lidded container by William Moorcroft decorated in the “Big Poppy” pattern circa 1916/18 which on this occasion I valued at £350 for the purposes of probate. William Moorcroft was born in Burslem, Staffordshire. He studied art at Burslem then in London and Paris. 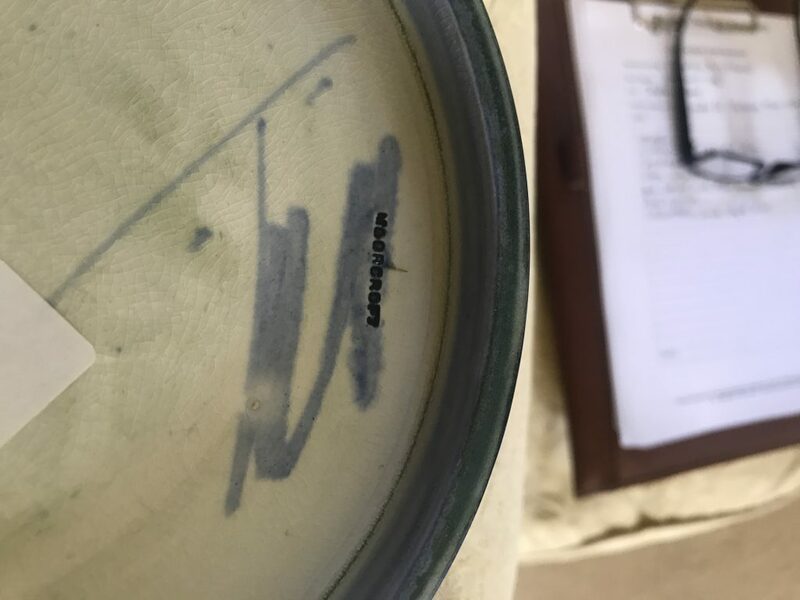 He experimented with his own pottery designs around 1896 while working for James Macintyre and produced Aurelian Ware which was partly decorated with transfers and partly painted by hand. Moorcroft developed highly lustred glazes and used oriental shapes and decorations. Some of his techniques were closely guarded trade secrets. He then developed his famous Florian Ware, with heavy slip and a translucent glaze which produces brilliance of colour. He married Florence Nora Fleay Lovibond (1879-1926) in 1913. They had a daughter, Beatrice (1914) and a son, Walter (1917). He then married, in 1928, Marian Lasenby, who was related to the Lasenby Liberty family who owned the popular department store in London. Miss Lasenby decided not to wear white when she married: her husband was a widower and 27 years her senior. Instead she ordered a dress with a hat and matching reversible coat from Liberty’s. In 1913, William Moorcroft set up his own factory at Cobridge with staff from Macintyres, and backed by a financial arrangement with Liberty & Co of London, The business succeeded. Much of the output was sold through Liberty & Co. and Tiffany in New York City. In 1928 Queen Mary made him “Potter to the Queen” through a Royal Warrant, which was stamped on the pottery. His son, Walter joined the company when he was twenty, and took over the management of the pottery in 1945 just before William’s death. Avery Associates provide clear and accurate open market valuations for the purposes of probate that will not be rejected by HMRC, feel free to call our head office for more help.